The Questions and Answers listed below were gathered from Help Desk inquiries and from the live “What’s New with the Finance Upgrade?” webinar on December 5. We will update this list as needed. Why should I use the Finance WorkCenter instead of Main Menu? 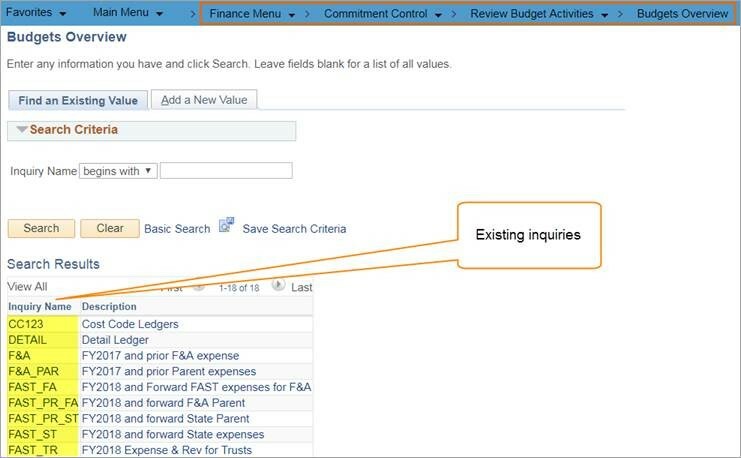 You’ll be able to get to the pages you use most frequently faster through the Finance WorkCenter. Can I change links that are on the Finance WorkCenter? 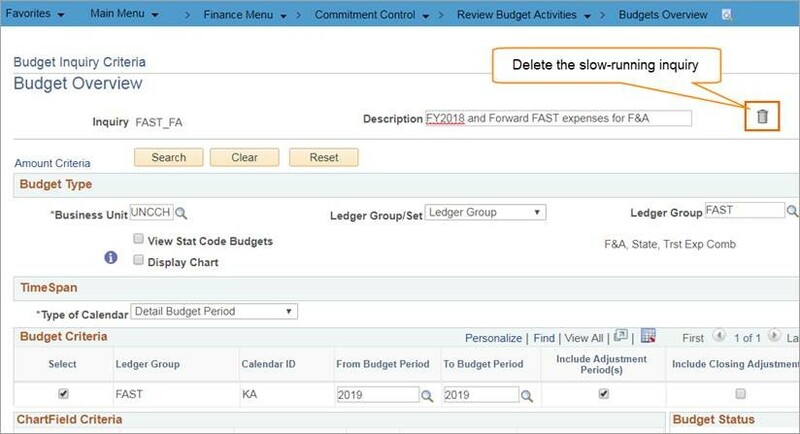 No, the links on the Finance WorkCenter were added by the ConnectCarolina team after working with both central offices and campus staff. What do you think we will like most about this upgraded software? The look and feel will be more user-friendly. There are a lot of changes on the backend and the processing should be faster. Any issues that we currently see with encumbrances and pre-encumbrances should be resolved. One of the best changes in the budgets section is being able to re-submit budget journals or budget transfers. Are the finance policies updated to reflect the new changes? For example, How-To's and guidelines in the training modules with step by step screenshots. Finance policies are being worked on, as relevant. The policies will not be changing to say “supplier” instead of “vendor.” Training guides are being updated and most will be uploaded to CCinfo.unc.edu by Friday afternoon, December 7. I like the system the way it is. Why do we have to change? In short, PeopleSoft is no longer supporting the software version (9.1) that we use for ConnectCarolina. We have to upgrade to software version 9.2 in order to receive support and take advantage of future enhancements and fixes. Just as important are the new software features and functionality that will make working in ConnectCarolina easier and faster and reduce accessibility barriers that make it difficult for many people with disabilities to use ConnectCarolina. Can we use the back button now? We still recommend using the breadcrumbs and navigation within ConnectCarolina rather than your browser’s back button. Will there still be an hour glass to show us that something is processing? Yes, you’ll still see the “spinning wheel” when the system is processing, but it should move faster in the upgraded system. I've noticed that Budgets Overview is running slowly. It even timed out. What should I do? Does the 'Save For Later' create a Voucher ID? Yes, ‘Save for Later’ creates a Voucher ID. If you save a voucher for later, does the system purge it after a certain amount of time? Vouchers that are not submitted at the end of the fiscal year will automatically be deleted. Nothing has changed regarding UNC voucher delete processing. Does the 'Save for Later' button work the same on Purchase Requisitions and Vouchers? The Save for Later button works slightly differently on the Purchase Requisition page than it does on the Voucher page. On the Voucher page, you only need to have the Invoice date, supplier, and category fields filled in. On the Purchase Requisition page, you need a valid chartfield string to save the transaction using the Save for Later button. If you use the 'Save for Later' feature, will you receive an alert that the saved voucher is there? No, you won’t receive an alert. You’ll have to use the Voucher ID to search for the saved voucher. Will there be an error message if a budget transfer/journal is rejected? There is no error message. If it’s in canceled status, it’s reverted back to the originator. Will the 'Deny' button be grayed on budget journals or budget transfers until comments are entered? No, the deny button will be available, but if you press the deny button without entering comments, you will receive an error message. 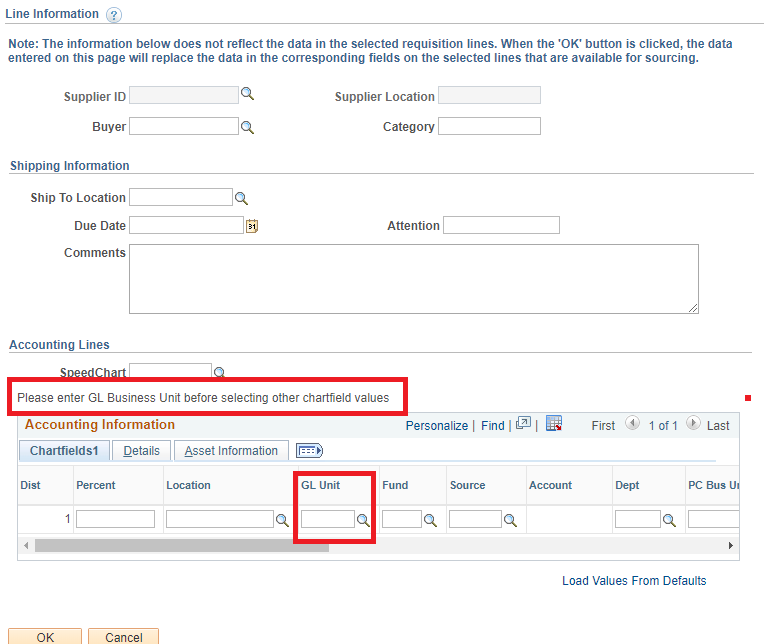 Is the new ‘Recently Ordered’ section in purchase requisitions based on user or by department? ‘Recently Ordered’ information is based on a user. You’ll see whatever requisitions you have submitted. If there are budget journals or transfers in denied status before the upgrade, will they be available to resubmit after the upgrade? Yes, any denied budget journals or transfers will be available to resubmit. If we have voucher templates right now, will those still exist after the upgrade? Yes, those templates will be carried forward into the upgraded system. All data that you see as of noon on Friday, December 7 will be there on Monday, December 10. When I use the Mass Change option, I received an error message that there was 'no matching value' for the chartfield string I entered. What do I do? In order to modify a chartfield string please make sure that you enter a GL Unit (i.e. UNCCH). Who do we contact if we have questions once we are in the live system. You can contact the Business Systems Help Desk at (919) 962-HELP or help.unc.edu. Do the changes affect the layout of the print outs for vouchers and requisitions? The print outs will be right aligned like they are on the screen. What you see on the screen is what you will receive in the printouts. In requisition, there was a section with 'Select lines' to and links to add to favorites in the Supplier Catalog. Is this used if you make the same purchases over and over again? Favorites is not supported due to frequent changes in supplier catalog order pricing. You can use Copy function under Manage Requisition for special requisitions. Will retrieving copies of deposits be easier after the upgrade? The process will be the same after the upgrade. Will this upgrade create changes for Web Travel via Connect Carolina? No, there are no changes in the Web Travel system. We currently get the message 'You need to attach a document' multiple times when processing a voucher. Will this go away in the upgrade? The project team will look into this issue. When I enter a requisition for the purpose of a PO (Special Item) there is a loop out to PolicyStat . When I click 'Special Item', shouldn’t the system recognize that I know that item is over $5000! When you see the message, click the Cancel button instead of OK to go, back to the requisition. Is the 'Attachments only visible for 90 days' policy going to change? It is not going to change as a result of the upgrade. Is 9.2 the most recent software version available to the University? Are we going to have to go through more outages? PeopleSoft 9.2 is the most recent software version and because we are reducing our customizations and using their ‘out of the box’ solution we can take advantage of their periodic ‘mini-upgrades’ that don’t require a long outage. There are so many little things to know and it is hard to remember them all! Is there a tips and tricks document to help us? There isn’t a single tip sheet for working in ConnectCarolina, but there is a lot of information on CCinfo.unc.edu. Look for the updated training guides specific to the areas of ConnectCarolina that you work in such as budgets or procurement. The recorded version of the webinar is posted on CCinfo.unc.edu. Click here to go directly to the video.